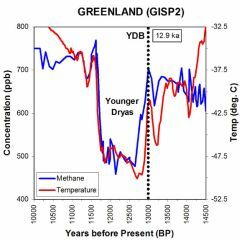 A black mat of carbonaceous material is associated with the onset of the Younger Dryas cooling event 12,800 years ago. Kennett, et al. 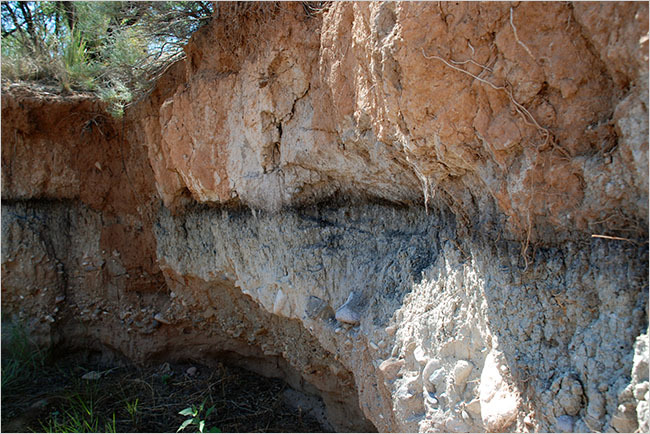 (2009) and Firestone (2007, 2009) have reported evidence of widespread biomass burning and the emplacement of a black mat at the Younger Dryas boundary. Firestone has proposed that the passage of a single or multiple extraterrestrial objects could have created fireballs that would have ignited a forest in seconds. Are these black mats the result of fires from an extraterrestrial impact? Could an extraterrestrial impact have caused a major burning event? A comet at a speed of 50 km/sec would traverse the atmosphere vertically in two seconds generating a very intense flash. An asteroid at a speed of 17 km/sec would generate a somewhat less intense flash lasting approximately six seconds. An oblique approach by the extraterrestrial projectile would substantially increase the time of intense radiation capable of carbonizing organic material. Some of the fires started by the passage of the projectile would be extinguished by the air blast of its shockwave. The biomass burning would have occurred during the passage of the projectile through the atmosphere and its initial contact with the Laurentide ice sheet. The greatest charring would be under the path of the fireball. At what angle did the meteorite strike? It is well known that the passage of a meteorite through the atmosphere is capable of igniting fires, as occurred in the 1908 Tunguska event. Davias and Gilbride (2010) proposed that the butterfly distribution of the Nebraska Rainwater Basins and the Carolina Bays could be explained by an extraterrestrial impact at a low angle in a trajectory from the northeast to the southwest. However, the major part of such a trajectory would have been over the Laurentide ice sheet that covered Canada and the northern portion of the United States. A trajectory over Canada would be less likely to cause major fires in the United States as far down as New Mexico, as reported by Firestone. An oblique trajectory from the southwest to the northeast by the extraterrestrial object could also have created the butterfly effect, but in addition, it would be more consistent with the bathymetry of Lake Huron and the burning as far south as New Mexico. Davias has proposed Saginaw Bay as the impact point of the meteorite. The deepest part of Lake Huron is in direct alignment with the orientation of Saginaw Bay, which is more consistent with a trajectory for a meteorite from the southwest. The following image of Lake Huron bathymetry has been marked to show the trajectory of the impact and possible shock fronts. 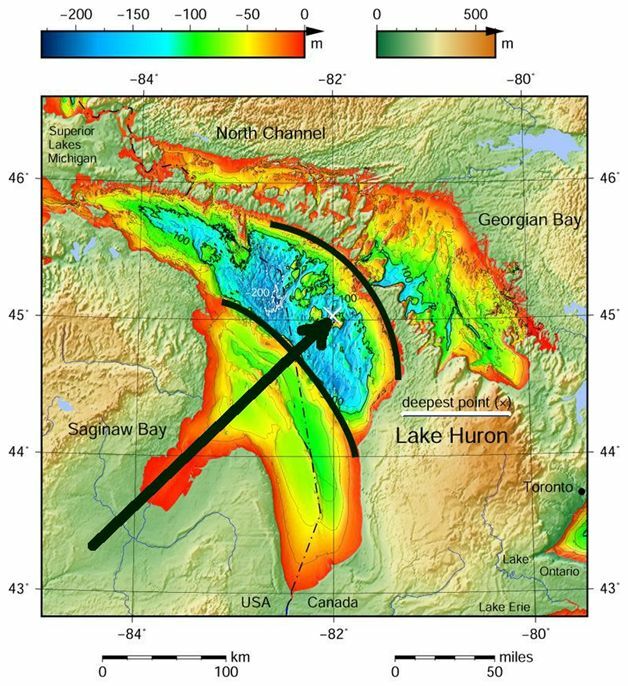 The point of the arrow is at the deepest point of Lake Huron. Would it be possible to calculate the angle of impact from the the deepest point of the lake of Lake Huron and the distance from Saginaw bay? Given that the distance from Saginaw bay to the deepest point is 200,000 meters and the depth is 230 meters, the impact angle is only 0.066°. Such a shallow angle is almost tangential to the surface of the Earth. We can calculate the maximum trajectory of a meteorite through the atmosphere by using a thickness of the atmosphere of 100 km, and the radius of the Earth as 6371 km. Then, we can calculate half the length of a chord where the sagitta is 100 and the radius is 6471. The maximum trajectory of a meteorite through the atmosphere is 1,133 km. The trajectory could be somewhat longer if the meteorite curved toward the Earth as it slowed down due to atmospheric friction. For an approach from the southwest with a target in Saginaw Bay, the meteorite would have entered the atmosphere above Missouri. To cover the distance of 1,133 km at a speed of 17 km/sec, a meteorite would have traveled through the atmosphere for 66.6 seconds. A comet at 50 km/sec would have traversed that distance in 22.7 seconds. Either way, the radiant energy of the incandescent projectile would have set fires along a broad swath under its path over the United States. The ecological effects would have been disastrous even before the secondary impacts from the ejecta. The idea that the black mats at the Younger Dryas Boundary are related to burning from the passage of a meteorite through the atmosphere is not supported by the following map from Haynes (2008). The following image has been marked with a red arc with a radius of 1500 km from Saginaw bay. The region with black mats seems to be beyond 1500 km from Saginaw Bay, except for North and South Dakota. The greatest burning should have occurred closer to the impact point of the meteorite, so the black mats are not likely to be related to burning. 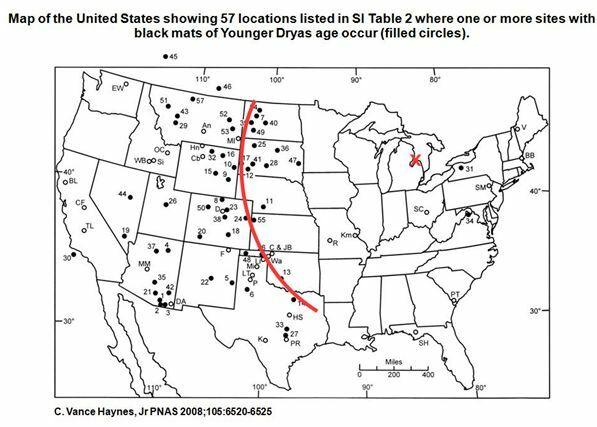 According to Haynes, the black mats are associated with wet conditions that persisted for a long time at the onset of the Younger Dryas cooling event. The area within a 1500 km radius from the impact point in Saginaw Bay was bombarded with glacier ice ejected from the Laurentide ice sheet (Zamora, 2017). How much ice dust would have been produced by bombardment of ice boulders on solid ground? Is it possible that the landscape beyond the 1500 km range of the ice projectiles could have been covered by ice crystals and dust from the saturation bombardment? A landscape smothered by dust followed by the Younger Dryas cold event could have provided the conditions for the emplacement of the black mat. Davias, M.; Gilbride, J.L., Correlating an Impact Structure with the Carolina Bays, GSA Denver Annual Meeting (31 October - 3 November 2010), Paper No. 116-13, 2010.